Even so, the same study finds laxative usage trending downward. "Use of laxatives was found to be less prevalent than in the past, and most people with evidence of constipation did not use them." That hasn't stopped marketers from turning log laying difficulties into a full blown public crisis on par with the apparent inability of the entire male species to get and maintain an erection. 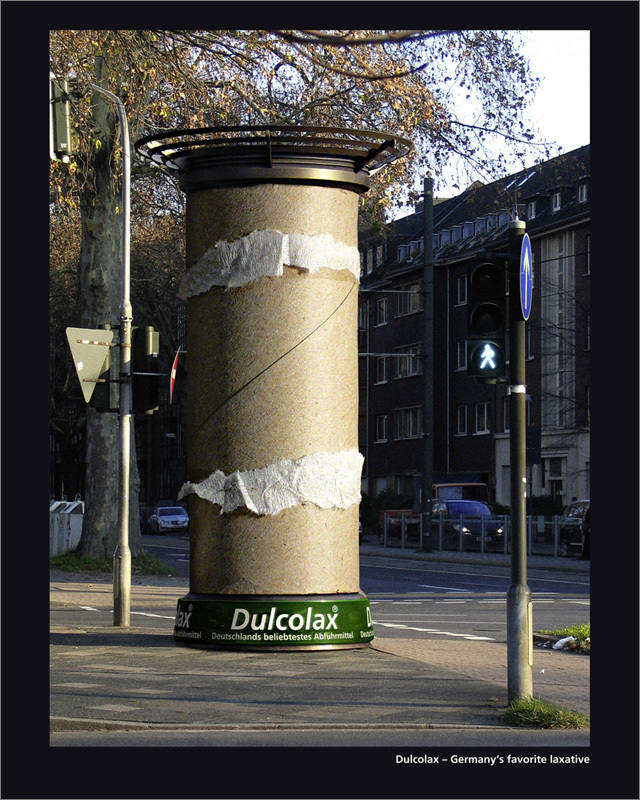 Working equally as hard as tampon makers do to stop the flow, laxative makers such as Ducolax are gleefully celebrating the bowel blowout with witty ads representing giant, used toilet paper rolls. Thx for sharing! Now that's an ad to have in your portfolio. I have to say that in the end it seems like the idea is brand appropriate. Those crazy europeans, got to love what they can push through the client. I wonder if this would ever get produced in the states. What if straining is the only exercise I get all day? And have you seen what Germans eat? I bet they consume more laxatives per capita than any other country. Jessie: you don't think that's really toilet paper, right?